He may be “Faster than a speeding bullet! More powerful than a locomotive! And able to leap tall buildings at a single bound!” but can the Man of Steel help you to a slots jackpot. That’s what you’ll be hoping for in Superman The Movie, a 5 reel, 100 payline video slot from Playtech that comes with a pick me feature, free spins with frozen wilds and progressive jackpots. Play, on mobile, tablet and desktop devices, from between 60p and £80 per spin. The imagery on show in Superman The Movie will be familiar to anyone who has seen the famous 1978 film – in addition to the lower value A to 10 playing cards are a necklace made from kryptonite, the logo of Clark Kent’s newspaper – The Daily Planet as well as Lois Lane (Margot Kidder), Lex Luthor (a young Gene Hackman) and Superman (Christopher Reeve). The famous red S found on Superman’s chest is the game’s wild – it substitutes for all other symbols with the exception of the pair of trigger inducing scatters. Superman The Movie comes with 2 bonus features – the first is the Crystal Bonus feature which is triggered by landing 3 Bonus symbols anywhere on the reels on the same spin. You’ll then be taken to a cave-like screen and given a choice of 14 crystals to pick from. Each 1 contains a 2x cash prize or a 5x cash prize. Pick the Superman logo and you’ll remove the kryptonite collect from your next pick. The arrow rebuilds the full complement of crystals. The picks continue until you find the collect. 3 Free Spins symbols on the same spin triggers the Save The Day Free Games feature – here you’ll be awarded 10 free spins. Any wilds that hit will be frozen once they hit. You’ll then receive a second chunk of 10 free spins – all of the accumulated frozen wilds from the first 10 free spins are locked in position for the last 10 free spins! Superman The Movie also offers a shot at winning potentially enormous progressive prizes as it’s part of Playtech’s DC Super Heroes Jackpot network – the progressive round can hit at random on any spin. You’ll then be given the pick of 20 icons. Click on 1 to reveal a colour that corresponds with the 4 different jackpots. 2 greens trigger the Mini, 3 blues the Minor, 4 yellows the Major and 5 reds the Grand which is where the eye-watering amounts of loot are awarded. 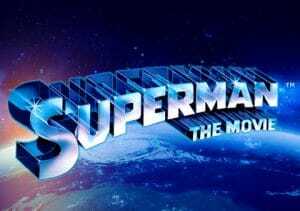 We enjoyed the original Superman The Movie and the video slot version is a pretty good adaptation. Featuring clips from the film, the visuals are well done, boosted by the classic Superman theme tune which blasts away throughout. The features aren’t especially innovative but are perfectly solid and can deliver well, especially the free spins where the frozen wilds can quickly pay rich dividends. Even if the Man of Steel isn’t your favourite superhero, Superman The Movie is still a very playable game – I also recommend Playtech’s other DC Comics inspired games such as Batman & Catwoman Cash and Batman & The Joker Jewels which are also part of the same progressive jackpot network.